Steven Ukoh says playing for Nigeria will be "a dream come true", explaining why he has chosen to represent the Super Eagles instead of Switzerland. 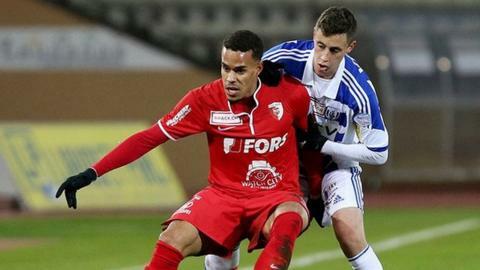 The former Switzerland youth international was able to switch allegiances under Fifa rules because he has not yet played for a country's senior national team. "I know that the Super Eagles is the pride of African football, so it was an easy decision," the 23-year-old told BBC Sport. "No one from Nigeria or Switzerland influenced my decision. I have wonderful parents who simply let me decide on my own and they've supported me. "I took my time and saw that it was right and best to play for Nigeria." The midfielder, who plays for FC Biel-Bienne in the Swiss second-tier, played for Switzerland at U-16, U-17, U-18, U-19 and U-20 levels between 2006 and 2010. But he jumped at the chance to be included in the Nigeria squad for their double-header friendly against Ivory Coast and Sudan in the United Arab Emirates next month. "This is a dream come true for me because every footballer dreams of playing at senior international level," he said. "Few people can fulfil this dream, actually I just want to play football and give my best. "The country has great players but I'll try to take advantage of this great opportunity. "It's an honour for me to play for my homeland and I am looking forward to visiting my extended family in Nigeria." Ukoh becomes the latest player to switch allegiance to Nigeria at senior international level following in the footsteps of former England youth internationals Sone Aluko, Shola Ameobi and Victor Moses.